The constituent assembly was an assembly that envisaged for the establishment of our constitution of India, on which the entire nation after partition will be going to run. All the governmental bodies, institutions, public offices and officers will go to work under and through the Constitution that had been set up with the help of Constituent assembly. The constituent assembly was headed by Dr B.R. Ambedkar, under him members of constituent assembly were from different backgrounds of profession like lawyers, political leaders, philosophers, economists, intellectuals and national leaders of our nation. Before the making of constituent assembly, Pandit Jawaharlal Nehru, moved an ‘objective resolution’ on 13th December 1946 to set up the framework for the making of the constitution of India. Objective resolution was a framework set by the nationalist leader of our freedom movement of India, and it was a guideline given by supreme leaders to work on it, while making the Constitution. Well-being of the backwards and poor sections of the societies. At starting, India was under British colonial rule, initially the British East India company came up with the motive of trading, but after some time, the deftly changed their motive to set up a colony in India. Latterly, covered all parts of India and set up a British India government and provincial States. But in 1857, a ‘Sepoy mutiny’ had taken place and shaken the roots of British rule in India, and then after the East India company rule had been shifted to the British crown rule under direct order of British parliament and queen in 1858. Scholars and historians termed this Sepoy mutiny as ‘the first war on freedom of India’. But after a decade, there were a lot of nationalist movements took place for the freedom of India under popular leaders like Gandhiji, Subhash Chandra Bose, Nehru Sardar Vallabh Bhai Patel etc. In the last, the spark of national movement had burned down the rule and supremacy of British rule in India and finally it comes to an end on 15 August 1947. But after this, the real battle of building a nation has started, an Interim Government of India, formed on 2 September 1946 from the newly elected Constituent Assembly of India and had the task of assisting the transition of British India to independence. It remained in place until 15 August 1947, the date of the independence of India, and the creation of Pakistan. The interim government was headed by Pandit Nehru, and from there the process of making policies, the Constitution, rights has started for the prosperity and harmony of new India. The Constitution of India was made through the long process of formation of constituent assembly which drafted, , discussed, debated, deliberated, amended and finally formed a final Constitution of India. Its took 165 days or almost three years to complete the process of making the Constitution of India. The total members of constituent assembly were 389. The constitution of India is a dynamic and biggest written constitution of the world which was developed by the expert panel of constituent assembly, mostly the parts of the Constitution has been taken from the constitutions of other parts of the world. It is also said that our constitution is copy of Western country’s constitution, mainly British and United States of America. 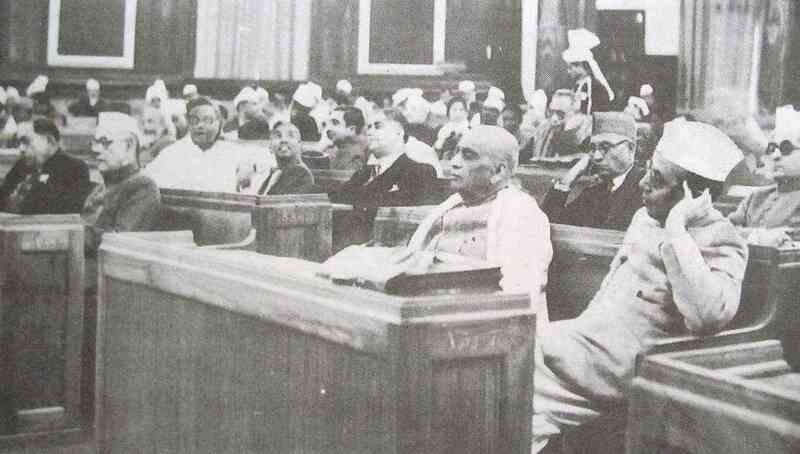 But the supporter of the constituent assembly and defenders of the constitution of India advocates that, the constituent assembly taken inspiration from other constitutions of the countries and after the long procedure of scrutiny they have adopted the best form of laws and best parts of the constitution from different constitutions, so that they can penned down the best constitution in the world. Lawyer’s Paradise – many critics have said that the constituent assembly was mainly consists of majority of lawyers and advocates so it limits the flexibility and simplicity of the Constitution of India and hence, for common people, it’s like more dependable on the norms and laws of the constitution. The elephantine size of the constitution- unlike the constitutions of other countries which are mainly focused on the simplicity and briefly approaches, our constitution is rigid and very long so it’s creates complexity of processes. Critics also argue that our constitution is the biggest and lengthiest written constitution of the world and it consists of currency, it has a preamble, 25 parts with 12 schedules, 5 appendices, 448 articles, and 101 amendments. Critics also highlight that due to its vastness which contains approximately 145,000 words, give rise to confusion and create loopholes and the sole purpose of the Constitution is to provide justice and equality slowly starts fading out due to its complexity and rigidity of the Constitution of India. After the long fight for freedom, we finally got the independence on 15 August 1947 and a hard work of a few years we made out our constitution and finally adopted it on 26 January 1950. And from then it sets an example to other nations of the world that a poor country can also have democracy and a well-written constitution for their nation. By witnessing, a lot of instability and wars with other countries, we are still able to maintain our country run in accordance with the constitution and it prevails the popular democracy of the world in India. Instead of joining any camps after the second world war, we fought for our independence and gave a message to other countries that if there is a will and efforts ofthe leaders of the nation, then a poor and over populated country can also develop at a high rate of development and by giving equal rights and protections to all and each individual of the our society, shows the success and aspirations of constituent assembly. So, India sets an example to other countries of the world and propagate the message of democracy and unity in diversity.